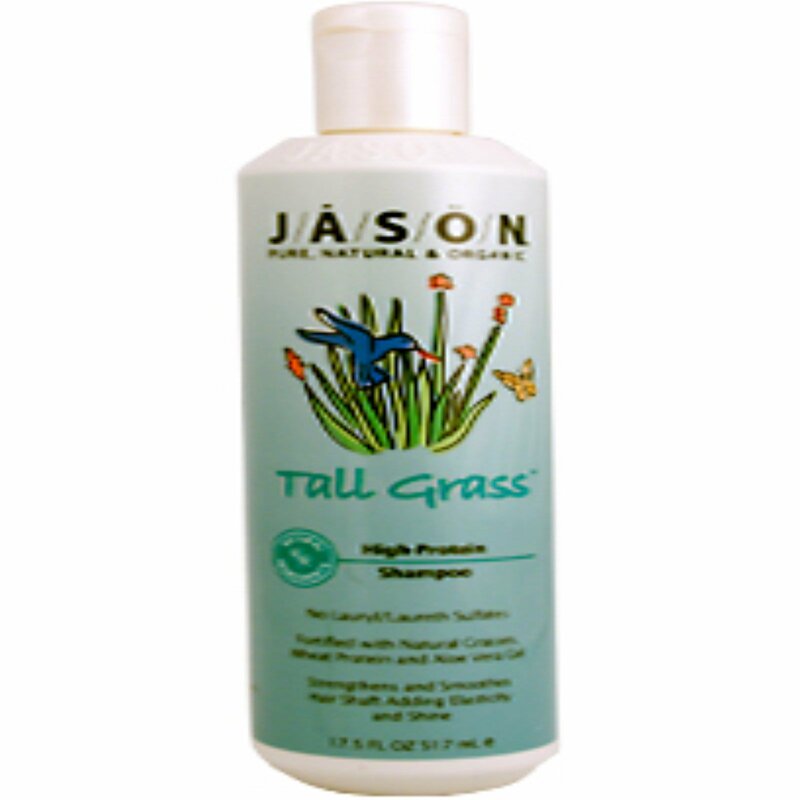 Tall Grass High Protein Shampoo for all hair types. This gentle botanical shampoo, formulated with mild, plant-based surfactants thoroughly emulsifies all residue on scalp and hair without dryness or irritation. Frees hair follicles of all clogging debris. Natural Grasses, Whole Wheat Proteins, Horsetail and other plant extracts strengthen and smooth the hair shaft to protect against environmental damage. Adds a healthy shine, fullness and elasticity to hair. Facilitates wet and dry combing. Keeps hair cleaner and glossier longer. Thoroughly wet hair. Always do a quick light-lathering shampoo first. Rinse and follow with a second super-lathering to thoroughly remove stubborn oils and excess daily dirt and debris. For added fullness and protection, follow with Jason Tall Grass High-Protein Conditioner. Aqua (Purified Water), Sodium Myreth Sulfate, Hordeum Distichon, (Barley) Extract, Cocamidopropyl Betaine, Triticum, Vulgare (Wheat) Grass Extract, Secale Cereale (Rye) Extract, Decyl Glucoside, Medicago Sativa (Alfalfa) Extract, Polyquaternium-7, Aloe Barbadensis (Aloe Vera) Leaf Gel*, Cyclomethicone, Anthemus Nobilis (Chamomile) Flower Extract*, Dimethicone, glycerin (vege), calendula officinalis (marigold) flower extract*, Camellia Sinensis (Green Tea) Leaf Extract, Panthenol (Vit. B5), Equisetum Arvense (Horsetail) Leaf Extract*, Mentha Piperita (Peppermint) Leaf Extract, Nasturtium Officinale (Watercress) Extract, Tocopheryl Acetate (Vit E), Triticum Vulgare (Hydrolyzed Wheat) Protein, Retinyl Palmitate (Vit A), Citric Acid, Citrus Grandis (Grapefruit) Seed Extract, Sodium Benzoate, Potassium Sorbate, Fragrance Oil Blend, Natural Color. Contains NO Lauryl/Laureth Sulfates, Animal By-Products, Animal Testing or Parabens.